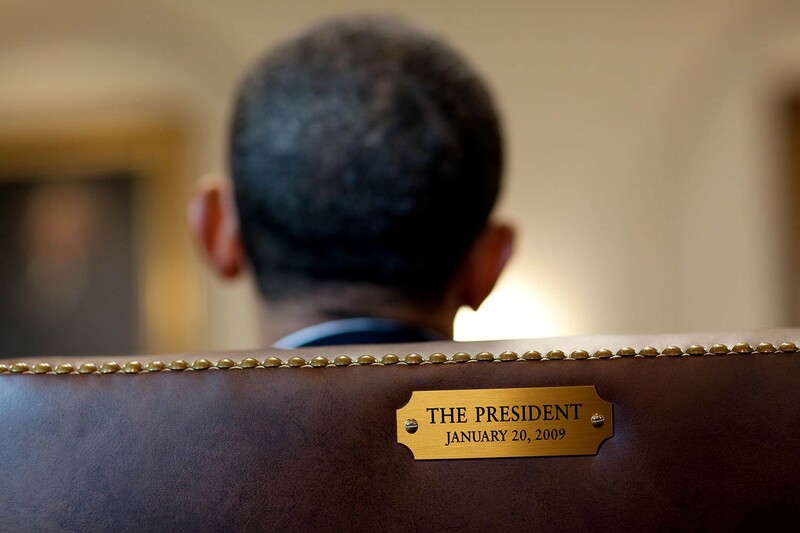 Editor’s note: As we look back on the past eight years, President Obama asked each member of his Cabinet to write an Exit Memo on the progress we’ve made, their vision for the country’s future, and the work that remains in order to achieve that vision. Read President Obama’s cover letter to the American people, then explore each of the Cabinet Exit Memos here. Eight years ago, America faced a moment of peril unlike any we’d seen in decades. A spiraling financial crisis threatened to plunge an economy in recession into a deep depression. The very heartbeat of American manufacturing — the American auto industry — was on the brink of collapse. 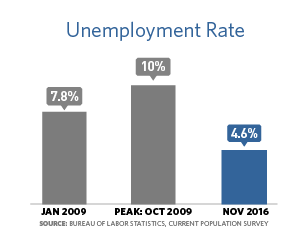 In some communities, nearly one in five Americans were out of work. 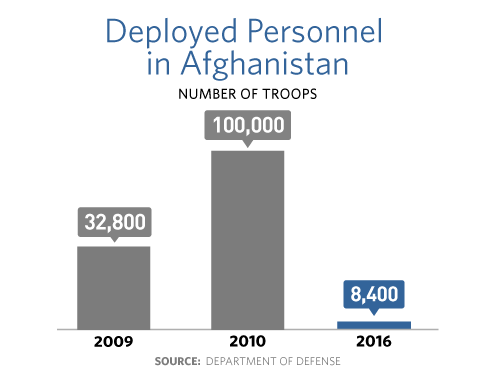 Nearly 180,000 American troops were serving in harm’s way in Iraq and Afghanistan, and the mastermind of the worst terror attack on American soil remained at large. And on challenges from health care to climate change, we’d been kicking the can down the road for way too long. But in the depths of that winter, on January 20, 2009, I stood before you and swore a sacred oath. I told you that day that the challenges we faced would not be met easily or in a short span of time — but they would be met. And after eight busy years, we’ve met them — because of you. Eight years later, an economy that was shrinking at more than eight percent is now growing at more than three percent. Businesses that were bleeding jobs unleashed the longest streak of job creation on record. The auto industry has roared its way back, saving one million jobs across the country and fueling a manufacturing sector that, after a decade of decline, has added new jobs for the first time since the 1990s. And wages have grown faster over the past few years than at any time in the past forty. Today, thanks to the Affordable Care Act, another 20 million American adults know the financial security and peace of mind that comes with health insurance. Another three million children have gained health insurance. 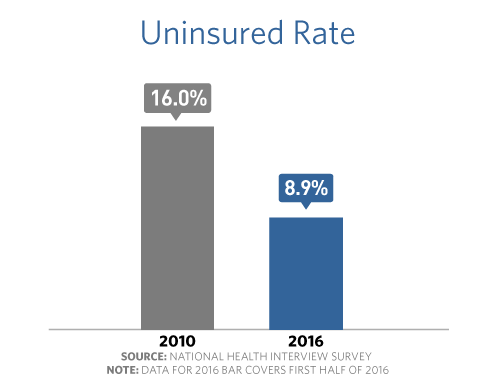 For the first time ever, more than ninety percent of Americans are insured — the highest rate ever. We’ve seen the slowest growth in the price of health care in fifty years, along with improvements in patient safety that have prevented an estimated 87,000 deaths. Every American with insurance is covered by the strongest set of consumer protections in history — a true Patients’ Bill of Rights — and free from the fear that illness or accident will derail your dreams, because America is now a place where discrimination against preexisting conditions is a relic of the past. 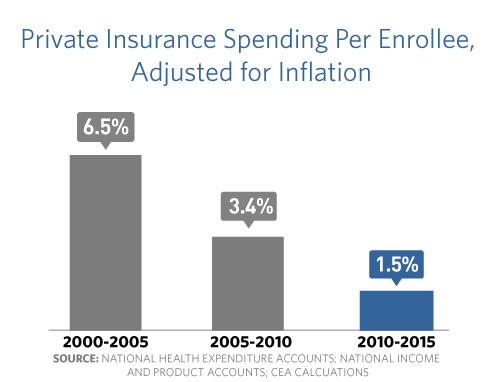 And the new health insurance marketplace means that if you lose your job, change your job, or start that new business, you’ll finally be able to purchase quality, affordable care and the security and peace of mind that comes with it — and that’s one reason why entrepreneurship is growing for the second straight year. 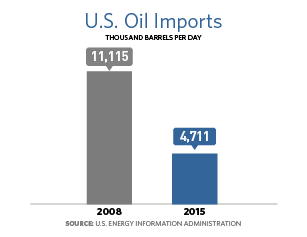 Our dependence on foreign oil has been cut by more than half, and our production of renewable energy has more than doubled. 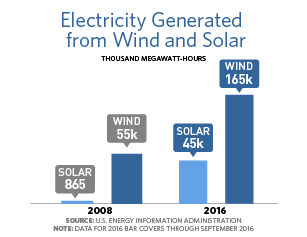 In many places across the country, clean energy from the wind is now cheaper than dirtier sources of energy, and solar now employs more Americans than coal mining in jobs that pay better than average and can’t be outsourced. We also enacted the most sweeping reforms since the Great Depression to protect consumers and prevent a crisis on Wall Street from punishing Main Street ever again. 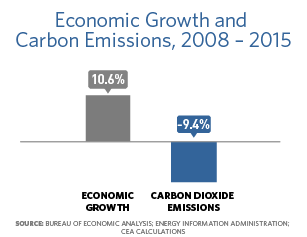 These actions didn’t stifle growth, as critics predicted. Instead, the stock market has nearly tripled. Since I signed Obamacare into law, America’s businesses have added more than 15 million new jobs. And the economy is undoubtedly more durable than it was in the days when we relied on oil from unstable nations and banks took risky bets with your money. 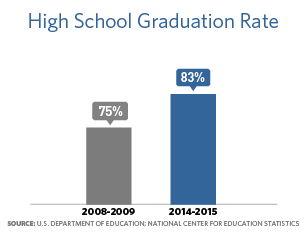 The high school graduation rate is now 83 percent — the highest on record — and we’ve helped more young people graduate from college than ever before. At the same time, we’ve worked to offer more options for Americans who decide not to pursue college, from expanding apprenticeships, to launching high-tech manufacturing institutes, to revamping the job training system and creating programs like TechHire to help people train for higher-paying jobs in months, not years. We’ve connected more schools across the country to broadband internet, and supported more teachers to bring coding, hands-on making, and computational thinking into our classrooms to prepare all our children for a 21st century economy. Add it all up, and last year, the poverty rate fell at the fastest rate in almost fifty years while the median household income grew at the fastest rate on record. 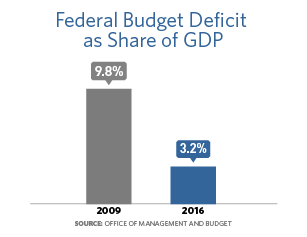 And we’ve done it all while cutting our deficits by nearly two-thirds even as we protected investments that grow the middle class. Meanwhile, over the past eight years, no foreign terrorist organization has successfully planned and executed an attack on our homeland. Plots have been disrupted. Terrorists like Osama bin Laden have been taken off the battlefield. 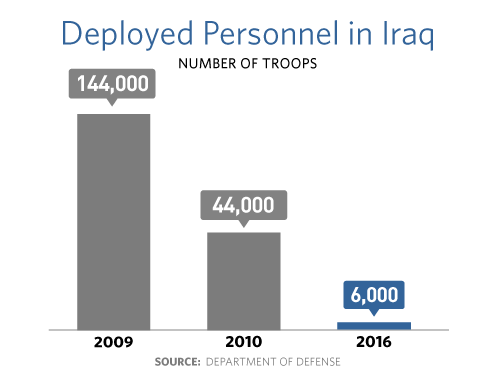 We’ve drawn down from nearly 180,000 troops in harm’s way in Iraq and Afghanistan to just 15,000. With a coalition of more than 70 nations and a relentless campaign of more than 16,000 airstrikes so far, we are breaking the back of ISIL and taking away its safe havens, and we’ve accomplished this at a cost of $10 billion over two years — the same amount that we spent in one month at the height of the Iraq War. At the same time, America has led the world to meet a set of global challenges. Through diplomacy, we shut down Iran’s nuclear weapons program, opened up a new chapter with the people of Cuba, and brought nearly 200 nations together around a climate agreement that could save this planet for our kids. With new models for development, American assistance is helping people around the world feed themselves, care for their sick, and power communities across Africa. And almost every country on Earth sees America as stronger and more respected today than they did eight years ago. All of this progress is due to the service of millions of Americans in intelligence, law enforcement, homeland security, diplomacy, and the brave men and women of our Armed Forces — the most diverse institution in America. We’ve also worked to make the changing face of America more fair and more just — including by making strides towards criminal justice reform, making progress towards equal pay, repealing Don’t Ask, Don’t Tell, and advancing the cause of civil rights, women’s rights, and LGBT rights. I appointed two extraordinary women to the Supreme Court, marking the first time in history that three women sit on the bench, including the first Latina. 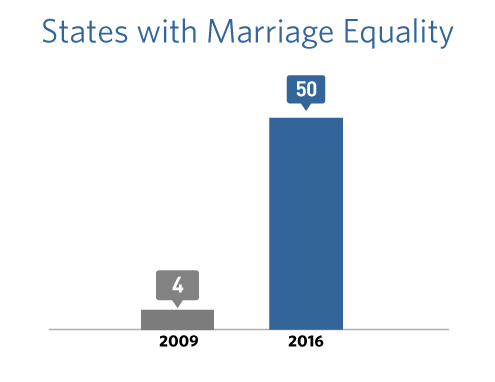 And today in America, marriage equality is finally a reality across all fifty states. 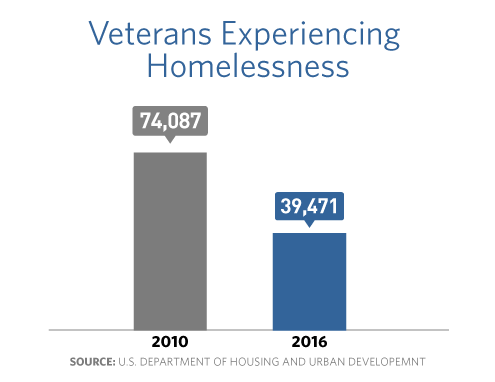 This is where America stands after eight years of progress. By so many measures, our country is stronger and more prosperous than it was when we started — a situation I’m proud to leave for my successor. And it’s thanks to you — to the hard work you’ve put in; the sacrifices you’ve made for your families and communities; the way you’ve looked out for one another. Still, through every victory and every setback, I’ve insisted that change is never easy, and never quick; that we wouldn’t meet all of our challenges in one term, or one presidency, or even in one lifetime. And for all that we’ve achieved, there’s still so much I wish we’d been able to do, from enacting gun safety measures to protect more of our kids and our cops from mass shootings like Newtown, to passing commonsense immigration reform that encourages the best and brightest from around the world to study, stay, and create jobs in America. And for all the incredible progress our economy has made in just eight years, we still have more work to do for every American still in need of a good job or a raise, paid leave or a dignified retirement. We have to acknowledge the inequality that has come from an increasingly globalized economy while committing ourselves to making it work better for everyone, not just those at the top, and give everyone who works hard a fair shot at success. And here’s the thing — over the past eight years, we’ve shown that we can. 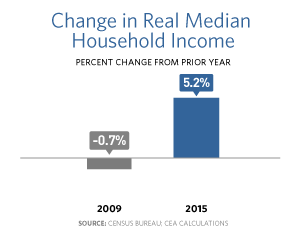 Last year, income gains were actually larger for households at the bottom and the middle than for those at the top. We’ve also made the tax code fairer. The tax changes enacted over the past eight years have ensured that the top one percent of Americans pay more of their fair share, increasing the share of income received by all other families by more than the tax changes in any previous administration since at least 1960. Simply put, we’ve actually begun the long task of reversing inequality. But as the global economy changes, we’ll have to do more to accelerate these trends, from strengthening unions that speak for workers, to preventing colleges from pricing out hardworking students, to making sure that minimum wage workers get a raise and women finally get paid the same as men for doing the same job. What won’t help is taking health care away from 30 million Americans, most of them white and working class; denying overtime pay to workers, most of whom have more than earned it; or privatizing Medicare and Social Security and letting Wall Street regulate itself again — none of which middle-class Americans voted for. We will have to move forward as we always have — together. As a people who believe that out of many, we are one; that we are bound not by any one race or religion, but rather an adherence to a common creed; that all of us are created equal in the eyes of God. And I’m confident we will. Because the change we’ve brought about these past eight years was never about me. It was about you. It is you, the American people, who have made the progress of the last eight years possible. It is you who will make our future progress possible. That, after all, is the story of America — a story of progress. However halting, however incomplete, however harshly challenged at each point on our journey — the story of America is a story of progress. Recently, I asked each member of my talented and dedicated Cabinet to prepare a detailed report on the progress we’ve made across the board these past eight years, and the work that remains to make this country we love even stronger. Today, I’m sharing them with you. And I hope you’ll share them with others, and do your part to build on the progress we’ve made across the board. It has been the privilege of my life to serve as your President. And as I prepare to pass the baton and do my part as a private citizen, I’m proud to say that we have laid a new foundation for America. A new future is ours to write. And I’m as confident as ever that it will be led by the United States of America — and that our best days are still ahead.